Magni-(The Powerful) Norse son of Thor and Jarnsaxa, possessed of more physical strength than all the Gods except perhaps Thor. His fate will be to survive Ragnarok and, with his brother Modi, drag Thor's Hammer Mjollnir to the meadows where survivors will gather to rebuild the world. Thrud-(Power/Strength) A Valkyrie who serves ale to the Einheriar in Valhalla. 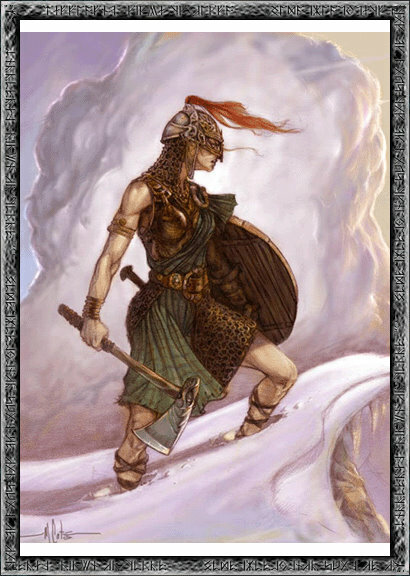 Norse daughter of Thor and Jarnsaxa. Some of the gods had promised to marry her to the dwarf Alvis, if he would forge weapons for them. Thor, however, did not like this arrangement and felt that a dwarf made an inappropriate son-in-law. He therefore devised a test of knowledge to prevent this marriage. Alvis had to prove that his great wisdom made up for his small stature. Thor prolonged the test until sunrise and Alvis, still caught up in the test, was touched by the rays of the sun and was turned to stone. Modi-(The Brave) Norse son of Thor and Jarnsaxa, Patron of Berserkers and the battle-mad. His fate is to survive Ragnarok and, with his brothers' help, drag Thor's Hammer Mjollnir to the meadows where survivors will gather to rebuild the world.